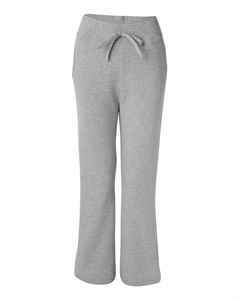 Made with 50/50 Cotton/Polyester preshrunk yarn, these ladies’ open bottom custom sweatpants are super soft to the touch. A covered elastic waistband with drawcord ensures a comfortable custom fit. These custom sweatpants feature scooped side-seamed pockets with jersey lining and a 5/8” rib-trimmed front pocket to hold your valuables. A slightly tapered leg with open bottom provide a relaxed style.